When Integreon planned a new building for Fargo, one that would bring both Fargo offices together under one roof, the initial workplace layout offered rows of workstations in a very traditional approach, hardly what a global, interconnected business needed. Integreon is a global company, with operations in Mumbai, London, New York, Boston, Washington, D.C., and half a dozen other cities, providing legal, document, business and research support to corporations, financial institutions, and legal and other professional service firms around the world. The company has operated in Fargo, North Dakota, for nearly 15 years, but had to split its 350 Fargo associates between two separate office buildings. This often made communication and collaboration, essential to Integreon’s business processes, a challenge. Integreon offices in distant locales routinely coordinate their work to support global clients. The Fargo office, for example, takes the lead in managing the contract review services Integreon provides for a Fortune 100 software company from delivery centers in Fargo; Bristol, UK; and Mumbai, India. Fargo maintains a dedicated team of seven paralegals for the client and must stay closely connected with the other offices in order to manage the client’s business. 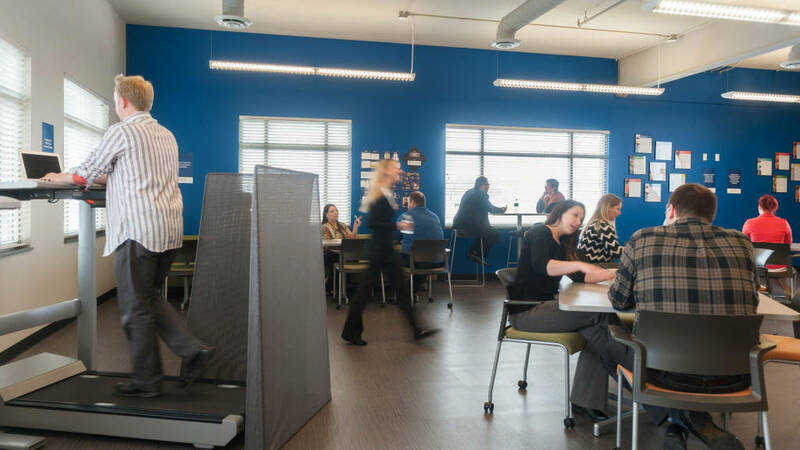 “We needed a work environment that would support interaction between colleagues, near and far, facilitating employee engagement and aligning with our company DNA of providing innovative solutions,” says Julie Laufenberg, vice president, Talent Management and head of the Fargo office. The Fargo facility was designed to leverage the company’s two greatest assets: their people and their real estate to support the communication and collaboration that drives innovation. About the same time, Integreon CEO Bob Gogel was attending a meeting of a European think tank in London when he met Guillaume Alvarez, senior vice president, sales and channels for Steelcase’s Europe, Middle East and Asia operations. After the two discussed the needs of a global organization and later visited the Steelcase WorkLife Center in Paris, the overarching workplace strategy for Integreon’s new facility in Fargo began to take shape. Integreon’s Fargo management team worked with the local Steelcase dealership, Hannaher’s, to create a work environment with a palette of workspace options for employees: a mix of individual, or “I”, spaces and various “we” spaces. On the “I” side, personal dedicated workstations are complemented on the “we” side by huddle rooms, a WorkCafé, a training space and three media:scape collaborative settings. As a 24/7 operation with three shifts, Integreon needed individual workstations designed to adapt quickly to different users. 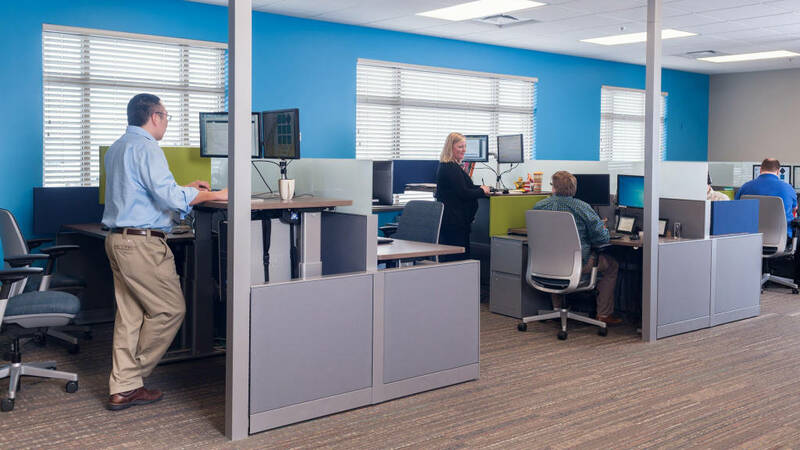 Height-adjustable work surfaces, adjustable monitor arms and seating with LiveLumbar™ support make it simple for users to work seated or standing and assume a variety of posture options. 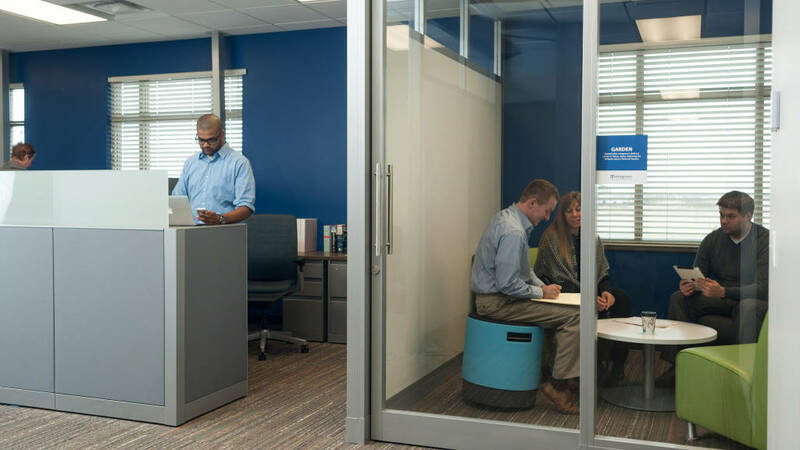 The workstations have low panels to foster communication and collaboration yet provide privacy when users are seated, enabling more focused work. To support frequent collaboration, huddle rooms are available in a mix of configurations, from lounge seating with low tables to media:scape spaces, which boost both inter- and intra-office communication and information sharing. “The huddles rooms have been a huge success. They are the first to be booked for meetings since it is so simple to plug in and immediately display the content for discussion. We have used them for internal meetings as well as global meetings with clients, or associates at other Integreon offices,” says Kalie Olson, Director of Finance & Sales Operations for Integreon’s Document Services team. The huddles rooms have been a huge success. They are the first to be booked for meetings since it is so simple to plug in and immediately display the content for discussion and are used for internal meetings as well as global meetings with clients, or associates at other Integreon offices, according to Kalie Olson, director of finance & sales operations for Integreon’s Document Services team. WalkStations in the WorkCafé support the company’s wellbeing initiatives, including a company-wide volunteer activity to walk the equivalent of 3 million steps, the distance between Integreon’s offices in Fargo and Washington, D.C.
Integreon clearly has created a work environment that supports their people, their work and work processes. “We had looked at existing spaces, how we might adapt them with the furniture we had. We evaluated the economics. We went for a totally different solution, a purpose-built building for us, with furnishings just for us, and that has made all the difference in the world. This is our building. It has everybody’s fingerprints on it,” says Gogel. 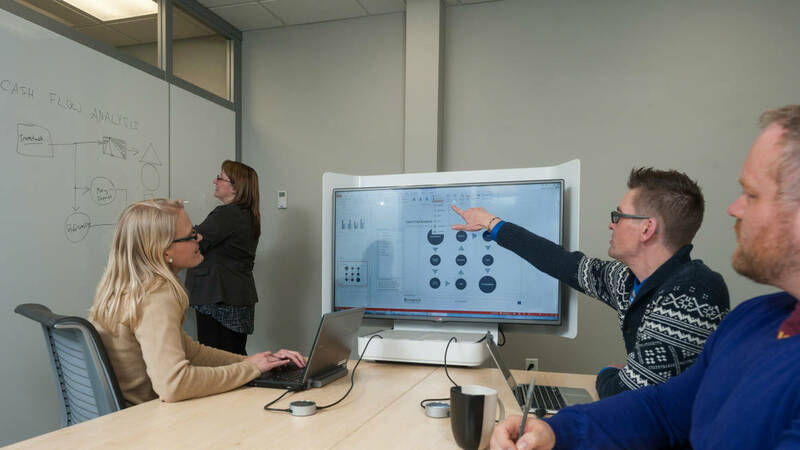 Integreon has been so impressed with the Steelcase products in Fargo that it has since outfitted Steelcase work products for another new office the company opened just recently in Austin, Texas.